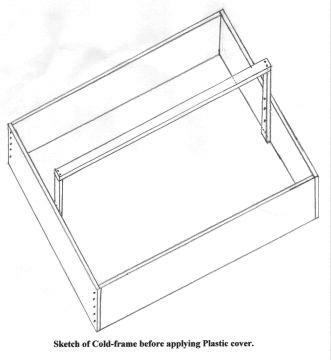 I’m sure there are many good ways to make a cold frame. This is the way I have been doing it since I got serious about growing Giant Pumpkins in 1984. I’m still using the one made that year, but will need to make a new one soon. You can make one of any size. The one I use is 7 feet wide and 9 feet long. The sides are made of 2 x 10 lumber. You need 2 pieces 7 feet and 2 pieces 9 feet long. They are nailed together at the corners to form a rectangle. Next, on the center of both ends (7 foot wide) nail or screw a 2 x 4 on the inside long enough so it sticks up above the end pieces about 10 inches. These support the peak, which is a 7 foot 2 x 4. It is covered with either 4 or 6 mil clear plastic that is stapled in place and then 1 x 2’s are tacked on the top of the 4 sides to securely hold the plastic in place. These are just attached with short nails because the plastic sometimes needs to be replaced. I start my Giant type and Burpee Prizewinner seeds in this cold frame. I keep a 4-foot board at the edge of the cold frame, which is used to hold up one edge while working in the cold frame. I have several smaller cold frames that are approximately 3 feet wide and 5 feet long that I use to start a lot of garden plants. The sides of these are either 1 x 8 or 2 x 8 lumber. The end pieces on these only stick up about 6 inches to support the peak. They are light enough that I remove them to work inside. It gets very hot under these cold frames on sunny days. When plants start to emerge, I put a long piece of Duct tape on both sides of the peak. Use a razor blade to cut several slits thru the tape and plastic so the hot air at the peak can escape.